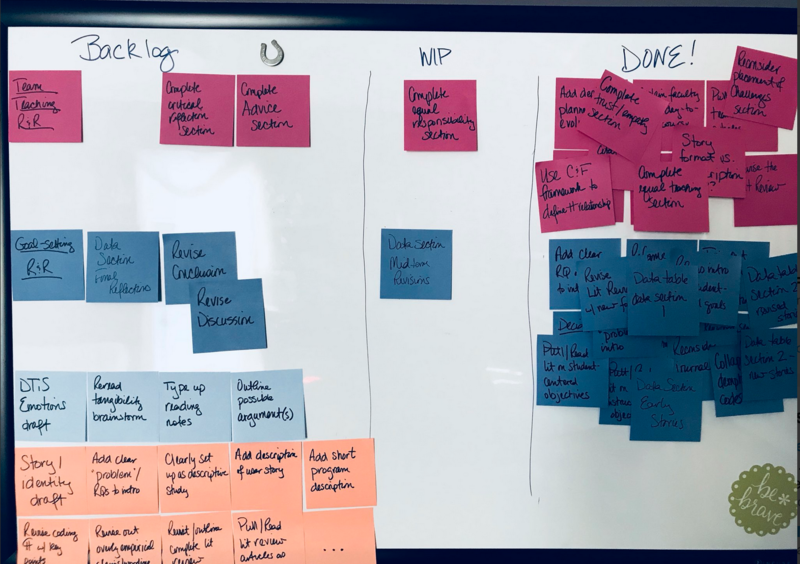 Move those last three pink stickies into Done, and you have my end-of-sprint board update. A lot of progress here when you compare the Backlog and Done columns across the week! And that’s with me revising the Backlog tickets for the team teaching article twice and the goal setting article once during the week. Now, a pure Agilist would not be impressed with this. I started with two articles three weeks ago and barely finished one of them. One of the major tenets of Scrum is to finish workable or valuable product by the end of the sprint. In a mechanical sense, I should have stuck to one article, completed it entirely, and then jumped to the other. But, you know what? I’m not mechanical, I needed to change gears and follow the energy to be productive while maintaining my interest and spirit while keeping up with non-writing related work (and a few migraine days). No one is really waiting on pins and needles for me to finish these articles. I’m writing for me (and my colleagues in the program I’m writing about). So I’m comfortable with my decisions throughout the sprint challenge. As I acknowledged mid-week, one of the of the reasons for the push-pull dynamic this month has been an underlying emotional current for me. I’m writing about a pilot program that my colleagues and I put our hearts and souls (and careers) into. And it was a struggle, hard intellectual and emotional work, intense, full of really high highs and lowest lows. I know that sounds dramatic, bear with me, but I am still processing that semester, even as we plan the day-to-day details of the second pilot which starts very soon. 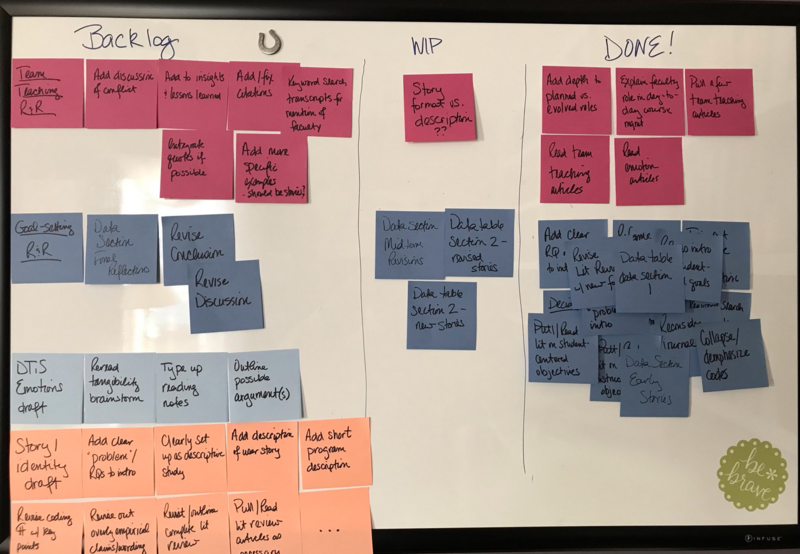 Through writing these articles, I’m processing that experience for myself and so that we can improve the second iteration (like any good Agile project) and share knowledge with our peers in higher ed who we know will find value in the work. So completing these revisions, which required diving deeply back into the pilot semester, has been in many ways a new writing context for me. I frequently do Scholarship of Teaching and Learning, writing about my own classes and student experiences using Scrum. But the pilot program was so much more of a risk, a challenge, so I feel differently about the scholarship piece. It’s OK – we need to not deny the emotional aspects of teaching and learning if we want to remain engaged, active, vital faculty. 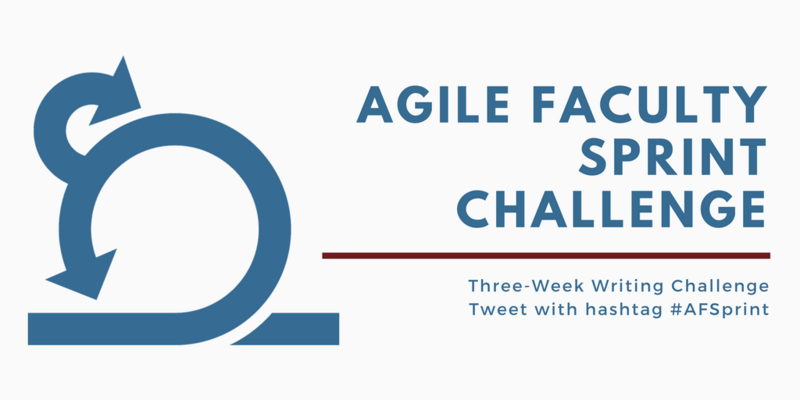 But I’m not sure I would have been brave enough to work through these articles without the #AFSprint challenge accountability – if you’ve been following along, thank you. I learned a lot during this sprint (hope you did too!) and look forward to sprinting with you again soon!